Twisted Tales – Now Available! Twisted Tales from the Torchlight Inn (a 3-novella collection by Thomas A. Erb, Dean Harrison & Myself), which contains my novella, ‘Last Night Out’, is now available for purchase through an affiliate bookstore of Wicked East Press. Below is a synopsis for each novella, followed by ordering information. Gabe, Alan and Erin thought one last night out on the town before their junior year of college came to an end would be fitting. They were the best of friends and not seeing each other for an entire Summer vacation was not something they were looking forward to. So they did what they always did on a Friday night – they went to a bar. 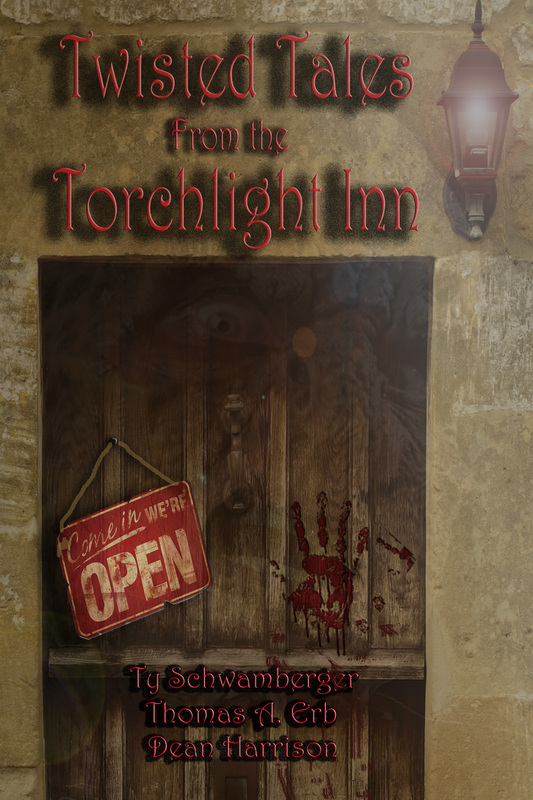 Only this time they decided to try someplace new – The Torchlight Inn. Even though there is some internal strife within the group of friends by the time they make it to the bar they are eager to try and make the night one to remember. But it’s during their time in the shabby bar that they come face to face with some seedy bar patrons, a biker gang and one strange acting bartender named, T-Bone, that make their time together all that much more interesting. But all is still well until Alan and Erin mysteriously disappear and Gabe has to try and find his friends before paying his bar tab and walking out of the joint. In the dark recesses under The Torchlight Inn. Ashley and Maurice are in love. The two of them are headed to her hometown for the holidays to share the good news with her family. Those two things would drive any young man to drink but add the fact that he’s from the south and an African-American and they are headed to rural upstate town of Arcadia Falls, NY, where the reputation of toothless and inbred rednecks even scares the streetwise kid from North Carolina. Nevertheless, they are truly in love and Maurice is sure he’s encountered more dangerous things on the gang-filled streets of Durham. After a few practical jokes go wrong, Maurice is introduced to the Vanslycke family and welcomed with a lot of drinking and backslapping. An overzealous brother and a promiscuous bartender are the least of his concerns. Little do they know that four strangers are about to enter The Torchlight Inn and will forever change their lives. Blood flows as these Faux, Fab Four impersonators search for the “One”. They have a list, one of the bar’s occupants is on it, and they aren’t leaving until they have found them. No one is safe. A heavy winter storm rages outside the small tavern, while rage and gun fire rage inside. Can the young lovers escape? Who is the “One”? And what do the Frightful Four want? For spring break, Ellen Campbell is not going to party at the beach—she’s taking her new boyfriend, Shawn Farris, home to Miller Falls to meet her parents for the first time. She is very excited about it, but also nervous as to how her father, a famous crime writer, will take to Shawn, her very first boyfriend. Nevertheless, she is confident things will go great. After all, Shawn’s a great guy—she wouldn’t have fallen for him otherwise. But when the happy couple arrives to the house, they find an unexpected guest—Ellen’s brother, the black sheep of the family. He has returned home after a long hiatus, and Ellen is terrified to find out why. This family reunion may not go as well as she thought, especially after Ellen’s brother, seeking forgiveness, invites them to come along with him for a beer at a bar called The Torchlight Inn. You can order a copy of the Trade Paperback here. This novella collection will be also be available at all major online retailers sometime next week.